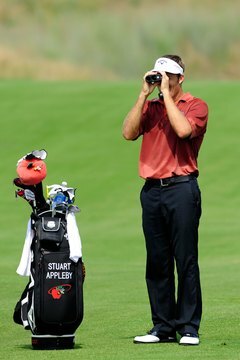 Stuart Appleby uses a rangefinder during a practice round. While there are other high-tech options, such as laser-sighted monoculars, or lower-tech options, such as built-in course yardage markers, a basic, reticle-based rangefinder is an excellent option for determining the distance to the pin. A rangefinder will give you an accurate read on how far it is to the pin, allowing you to always choose the perfect club. Ensure the course's flags are of proper height for your rangefinder by following steps 2 to 5 from an official marker as early in your round as possible. The reading on the reticle should match the reading from the marker. Find a location from which you can see the base of the flag stick. Ideally, this will be where your ball is; however. in the event of an elevated green, use your rangefinder from as close to your ball as possible. Look through the rangefinder using your dominant eye, with your nondominant eye closed. Position the baseline of the reticle on the base of the flag stick, where it enters the hole. Read the reticle by noting where the top of the flag stick falls in the reticle. The reticle will feature a vertical line or bar, with yardage numbers increasing as you move up it. The number where the top of the flag stick falls is your distance to the pin.